There are many different ways to utilize the Click to Call feature depending on your need at the time being. You can either use it by calling one specific person in mind. Or you can even pull up a list of people from the same company. 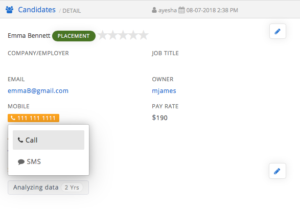 If you are looking to call one specific person in mind, simply click on the Candidates in the left navigation panel. From there, you can type the name of your contact into the white Search bar on the top of the page. After you find your contact, to the right of their name you will see their telephone number highlighted in orange. At this point if you click on the highlighted orange telephone number, you will be given an option to either call or send a text message to this contact. If you would like to call them, your phone will immediately ring and an operator will ask “if you would like to connect this call, please press 1”. By pressing one, you will immediately call your contact without you ever dialing their number. This tool is especially helpful if you are trying to call a large amount of people in one sitting.